The development of high speed rail, beginning in the 1950s and 60s in Japan and France, radically altered the way developed countries could plot out their transportation futures. Already developing their nuclear power plants, and neither with any native oil resources, each country saw the advantages of electricity-based transportation. As a result, neither automobiles nor airplanes, both oil-based, would work. So both embarked upon the world-changing quest that has been made manifest in the success of the Train à Grande Vitesse (TGV) (beginning in 1981) and Shinkansen (beginning in 1964). In both Japan and France, the equation for traveling distances less than 500 miles was suddenly altered as it became quicker, more economical, and more convenient to travel by train than by any other mode. Little by little, countries all over the world followed suit, building high speed rail lines fit for trains moving at speeds more than 150 miles per hour. – Germany, Belguim, Spain, Italy, South Korea, China, England, Taiwan. Today, there are high speed rail lines under construction or soon to be built in Argentina, Russia, Austria, South Africa, Turkey, Israel, Portugal, and Morocco. The implication is obvious: with the exception of the United States, all wealthy, developed countries have come to recognize the value and benefits of high speed rail. The U.S. has not always been behind on the development of faster railways. Back in 1969, Penn Central introduced the Metroliner, which sped from New York to Washington in three hours, quite fast for the time. But the bankrupcy of Penn Central, which was in itself a last minute merger between the Pennsylvania Railroad and New York Central attempting stave off their own financial problems, meant that high-speed rail development in America had little support. Simply enough, the government’s decision to step in with the creation of Amtrak solved one problem: the railways would remain open, albeit with limited service. Compare the services provided around the U.S. with those offered in France in the image above (click on image to expand, PDF here). 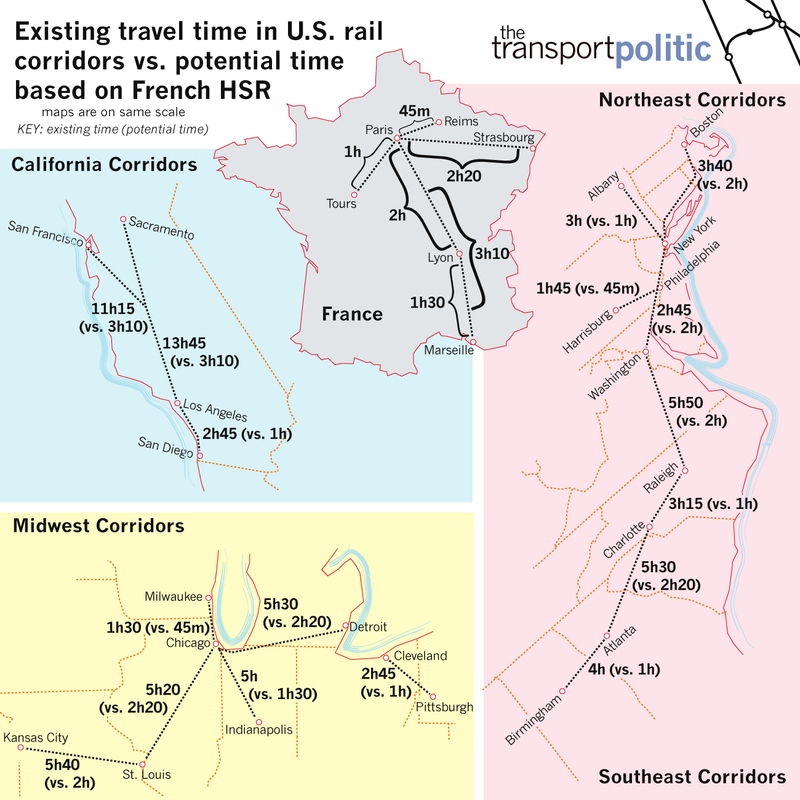 The difference is remarkable, especially when considering how much shorter travel times would be in the U.S. were trains to move at TGV speeds (a chart detailing the differences is below). But in the intervening years, though Congress has provided enough funds for daily operation, subsidizing the entity on the order of $1 billion a year, but it never stepped in to consider radical enhancements to Amtrak’s funding. In fact, service around the nation remains remarkably slow. That is, with the exception of the Acela Express. In 1976, just after the 1971 creation of Amtrak, the federal government took control of the Northeast Corridor (the tracks running from Washington to Boston), and commenced the Northeast Corridor Improvement Project. This project lasted until 1998 and cost $4 billion dollars; it resulted in the upgrading of significant number of stations as well as improvements on the tracks themselves, with the goal of speeding up service. It also, importantly, electrified the tracks between New Haven and Boston, which had until then required diesel locomotives. This in itself was a significant improvement for New York-Boston service because until 1998, electric trains from New York had to change to diesel locomotives in Connecticut – a time-consuming operation – the opposite was true going the other way. Amtrak’s goal was to take advantage of the improvements along the line to introduce its own high-speed train that would finally provide the United States with a TGV-like service. Between 1994 and 2000, Amtrak worked with Bombardier to develop a TGV-like trainset that would be able to tilt (like the Italian Pendolino) in order to operate smoothly on the old, curvy tracks of the Northeast Corridor. And indeed, when the Acela Express began service, it did, in fact, provide high levels of interior comfort and lounges at stations for first class customers. The problem was that it wasn’t any faster than the Metroliner it replaced. Embarassingly, Bombardier built the trains 4 inches too wide. This tiny error – which has yet to be corrected – makes it impossible for the Acela to tilt on the vast majority of its journey, making the design of the train basically worthless. Also, high-speed trains necessitate weighted catenaries to handle the immense amount of power being pressed against them as trains speed below, and only the new section east of New Haven has these. In order to achieve high speed throughout the corridor, the catenaries above tracks from Washington to New Haven would have to be upgraded, an expensive operation. The train does travel at its 150-mph top speed (nothing compared to 220-mph service now offered in Spain and China), but only for 18 miles in Rhode Island and Massachusettes, as widely noted. In much of Connecticut west of New Haven, it travels at a miserable 60-mph or less. But with new, slightly skinnier trainsets and upgraded catenaries, Amtrak could reduce travel time significantly – this is a must for future service in the Northeast. So the federal intervention on behalf of the national railroad was a failed one. But all is not lost on high speed. As has already been pointed out, Amtrak doesn’t have to do that much to upgrade the Northeast Corridor to higher speeds. And the service is already popular: it accounted for 50% of travel (air and rail) between Boston and New York at the end of 2007, and much more between Washington and New York. This market share would increase even with incremental decreases in travel time. But Amtrak CEO Alex Kummant has argued that 200-mph service on the Northeast Corridor is simply unlikely because no one is willing to provide the billions of dollars required to build new tracks and a new right-of-way that would be required to envision speeds that high. That may be true. But Florida Representative John Mica, who sees Amtrak as “Soviet-style” rail transport because it is a “government monopoly,” has introduced a solution: a declaration of willingness to accept private bids for new service between Washington and New York in less than two hours. Considering that every other high speed rail system in the world has been initiated through government investment, such private bids seem unlikely. Another bill seems more likely to produce real results: Massachusettes’ John Kerry and Georgia’s Johnny Isakson’s high speed rail bill, which has not yet been introduced, but which is likely to pass under the probable Democratic government next year. This bill would give billions of dollars in bonds to improvements to the intercity rail system, and there’s one project likely to get the bulk of funds starting next year, California’s High Speed Rail Project. We won’t get into the depths of this project now, but suffice it to say that it’s a $40 billion affair that proposes to move trains between San Francisco and Los Angeles in 2h20. Its fate depends on a favorable vote from voters this fall. There are other major projects we’ll talk about soon as well, including Midwest High Speed Rail (pushing out from Chicago), Florida High Speed Rail, the Texas T-Bone Corridor, Southeast High Speed Rail, a connection between New York and Montreal, and the maglev projects proposed between Baltimore and Washington, in Pittsburgh, between Chattanooga and Atlanta, and between Los Angeles and Las Vegas. All of these projects have at least some value, and in the Obama Administration, we’ll be talking a lot about them. Quite an exciting a future we have for high speed rail in the United States! And what a lot of catching up we have to do! The table below demonstrates how much travel time would be saved if select Amtrak routes were converted to HSR technology (this table corresponds to the image above).